I love the cover of 1947. This ‘literary scrapbook of the year’ by Elisabeth Åsbrink consists of a somewhat odd collection of facts from the year ‘when now begins’ as it says on that attractive cover. Maybe it’s true that life as we recognise it came into being two years after WWII ended. I don’t know. 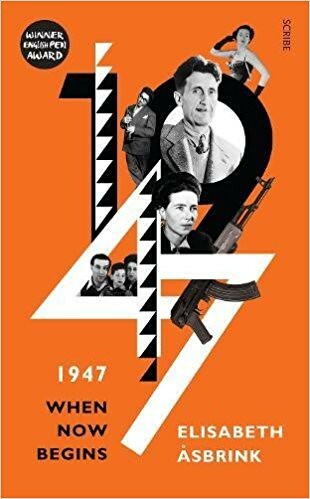 I began reading 1947 with the expectation of finding out; discovering some startling proof. But the book is mainly a series of unrelated stuff happening to people or countries during that year. I was waiting for a reason why George Orwell was in there, and what the significance of Simone de Beauvoir’s romantic interlude with some man in America might be for me. There are flying saucers. I like flying saucers, but why were they in there? About the most interesting fact – to me – was the possible background to the disappearance of Dagmar Hagelin in Argentina in the 1970s. That was part of my growing up. Elisabeth appears to have grabbed facts as she found them, putting them in for artistic effect. It feels a rather Swedish thing to be doing at the moment. For that’s what this is, the latest ‘historical’ offering from a woman whose own father escaped Hungary after the war. But that doesn’t explain all the rest; the UN, Palestine, Mahatma Gandhi, Christian Dior, Swedish nazis and fleeing nazi war survivors. I was hoping it would be fascinating, that it would teach me something new. Instead it was a return to the Emperor’s New Clothes, all over again. It’ll be fun to see how the rest of the world receives 1947. I found the English translation by Fiona Graham good enough to make me forget I was reading in the ‘wrong’ language. Have you any idea how often I ask myself this? On Tuesday I asked the question so often and so loudly that you could be forgiven for thinking it had been a while, whereas the question had popped up only last Friday. Do you remember SELTA? I blogged about them last year. They are the Swedish-English Literary Translators’ Association, and they do things I’m sort of interested in. And on Tuesday it was time for their AGM in London, and they thought it’d be good to ask a few ‘translated literature’ bloggers over for some light entertainment at the end. I was one of them, and why anyone would think I can speak in the first place, and why I might measure up next to two people who read almost exclusively translated, and literary, books, is beyond me. But there I was, pretending to speak about translation and other linguistic stuff. This is when I wasn’t feeling petrified at the mere idea. I garbled a few things at them, and I distinctly recall them laughing at one point, so I must have said something amusing. Shame I can’t remember what. I could use it again, if I did. Wait a minute! No, that would suggest I’d ever do this again. No need to know what was funny. They encouraged the asking of questions, so I asked whether they read the book before they translate it. Interesting reaction. Some do, some don’t. Those who do were shocked to find others don’t. My co-speakers were Stu Allen of Winstonsdad’s Blog, and Ann Morgan from A Year of Reading the World. As you will find if you look them up, they read adult books in translation. Ann spent a year reading a book from every country in the world, a while back. And Stu reads books from all over the world, as long as they have been translated. And then there was me. Let’s just say I wasn’t the most accomplished speaker in the room. But it was fun. Afterwards, I mean. Never again, though. Most likely. Afterwards we went to the pub. And after that Son and I went to Diwana Bhel Poori, before we slept our way north (where I was – accidentally – greeted on the platform by Helen Grant). And that’s where I am now. It’s easy to despair of the lack of translated books, sometimes. There’s the xenophobia, and I suppose lack of money for publishers. Maybe. 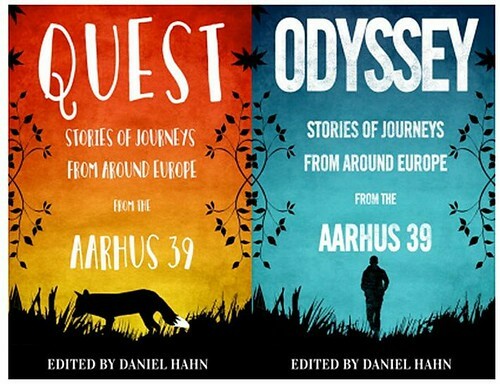 But for every iffy homegrown book, there might be a tremendously good foreign book, just waiting to be translated. 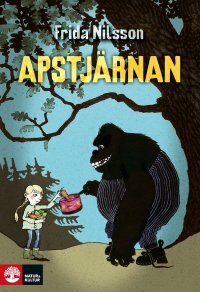 SELTA, the Swedish-English Literary Translators’ Association, have a blog, and recently Fiona Graham, one of their members, published her sample translation of a chapter from Frida Nilsson’s Apstjärnan, under the title My Mum’s a Gorilla – So What? and I have to say I love the title, and I really enjoyed reading it. Yes, I know I could read the whole book in the original, but I didn’t know about it until I read the SELTA blog. What could beat a gorilla teaching a small girl how to drive? Ridiculous, funny, entertaining. I can’t drive. Should I get a gorilla to help? Occasionally I email publishers and suggest foreign books they might look at. I think it’s a losing battle, but every now and then I feel strongly enough to do it anyway.